-- We hold an exhibition titled "Mosha Ten" at Art Data Bank from June 14 to 26.
but our "Mosha" does not intend to use the word as a teacher use in the classroom. 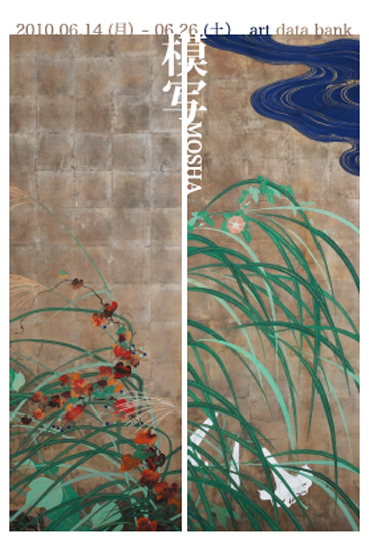 The works of "Mosha Ten" are not just any mimics and copies of great old Japanese artists. This time, four modern artists, Udaka, Soutome, Nakagami and Funahashi, who graduated from the Japanese Art History and Conservation department of Tokyo University of the Arts, consider those old Japanese arts with scientific examination. The four delicately try to use their interpretation of the classic arts and the traditional techniques by using colours which the old masters utilized. Examining these materials causes us to trace back to the traditional Japanese spirit. To produce one work, the artists spend mostly one year or over a year. In only two weeks, we have a oppotunity to view their work. We hope you take advantage of the oppotunity these four energetic artists' interpretation of the masters.